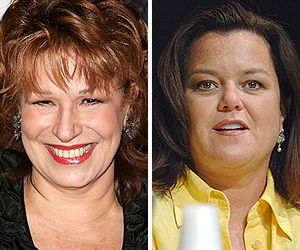 Rosie O'Donnell might not be making many friends with her new book "Celebrity Detox," but she has one pal in her corner -- Joy Behar. The "View" co-host attended last night's exhibition of Rosie's artwork, "Rosie O'Donnell: Solace-Paintings 2003-2005," in New York City. When asked about the event and her friendship with O'Donnell, Behar said, "It was great to see Rosie last night. We've been emailing each other and this was the first opportunity we've had to finally see each other. I hope this alleviates the concern amongst our fans who were worried that we might not still be friends. Her paintings are so original."